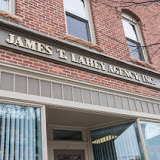 James T. Lahey Agency, Inc. The James T. Lahey Insurance Agency, Inc. is an independent North Country hometown insurance agency serving Potsdam, N.Y. and many surrounding communities since 1947. We work harder to assist you in developing the policy that is right for you! Locally owned and operated, we proudly offer a wide range of home, business and automobile insurance products at competitive prices.